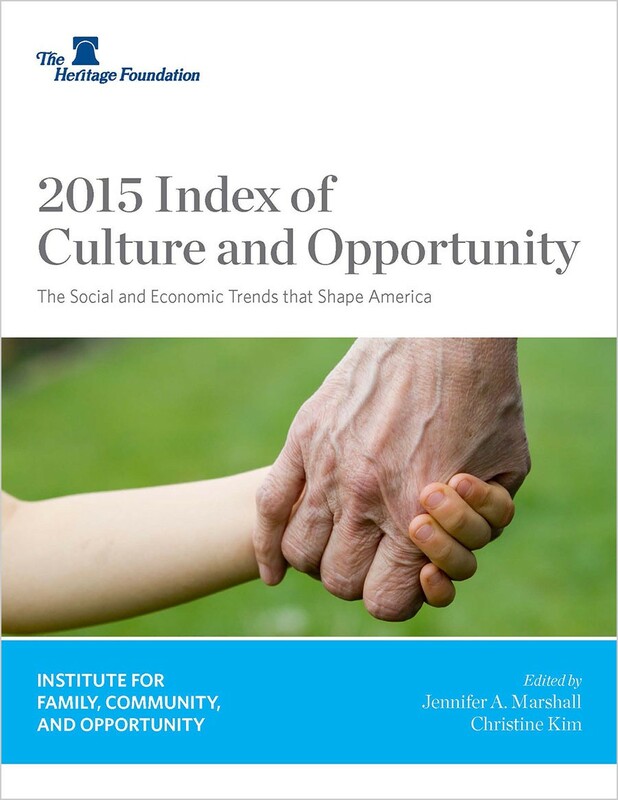 The Heritage Foundation’s Index of Culture and Opportunity tracks 31 social and economic indicators that shape opportunity in America. 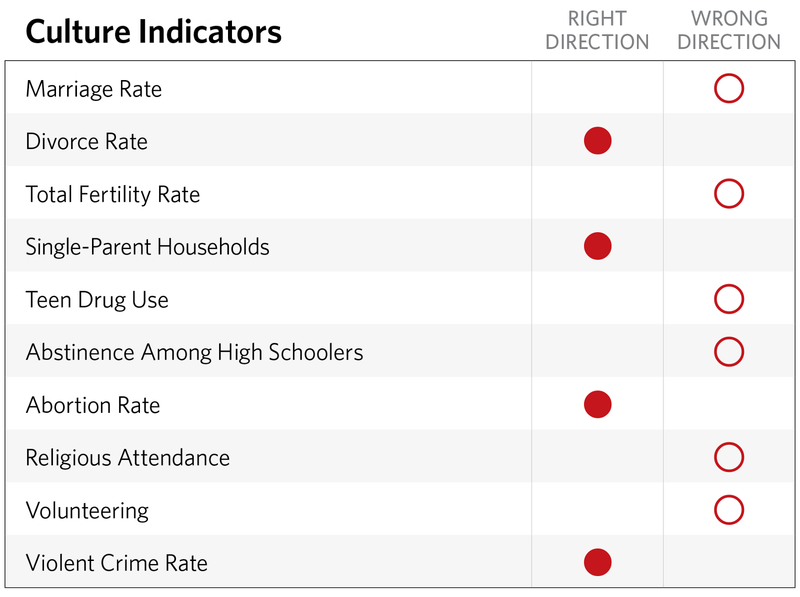 It presents the most recent data as well as longer-term trends for each indicator, focusing in particular on the past 10 years of available data to discern the trajectory of our culture. In addition, experts from a variety of disciplines and organizations offer commentary to contextualize these trends and explain why they matter. As a number of the commentators observe, opportunity requires a particular cultural ecosystem to flourish. This Index reports on the health of that environment. The marriage rate continues its decades-long decline. From 2002 to 2012, it fell by more than 9 marriages per 1,000 unmarried women age 15 and older. “Just as no-fault divorce altered the institution of marriage, … altering the very heart of the sexual structure of marriage is shaking the marriage ecosystem,” explains Mark Regnerus. More than one in four children live in single-parent households. Martin Brown notes what this means for America: “In 1965, Daniel Patrick Moynihan documented the increase in the number of single-parent households among blacks, and he appropriately sounded the alarm about the increasing breakdown of the black family. Today, this alarm should sound for the entire nation”. The abortion rate declined to pre-Roe v. Wade levels in 2011, the most recent year for which published data are available. Charmaine Yoest explains the scientific and legal advances that have brought about what she describes as a “seismic shift” over the past several decades. From 2004 to 2014, the percentage of volunteers in America declined by 3.5 percentage points to 25.3 percent. Despite the “exceptional endeavors” by some caring Americans, Marvin Olasky laments that “the distinctive character of America’s volunteer effort that de Tocqueville witnessed almost two centuries ago is much more difficult to discern today”. In 2013, 40.6 percent of children were born to unwed mothers, an increase of 6 percentage points since 2003; however, for the past five years, the percentage of unwed births has remained relatively stable. “[S]ocial scientists began to reach a consensus in the late 1990s that the children of single mothers were doing worse than the children of married mothers on just about every measure they studied,” writes Kay Hymowitz. From 2004 to 2014, total federal and state government spending on welfare programs increased by $250 billion (in constant 2014 dollars). “Far from being a compassionate series of programs worthy of defense against reform, the current welfare architecture has been a disaster for struggling communities and has done its gravest disservice to recipients themselves,” explains Paul Winfree. From 2004 to 2014, the number of Supplemental Nutrition Assistance Program (SNAP, also known as food stamps) participants nearly doubled to 46.5 million individuals even as the unemployment rate dropped. “One out of seven Americans received SNAP benefits in 2014,” notes Maura Corrigan, “and the program cost $74.1 billion — the second largest means-tested welfare program”. The number of subsidized housing recipients increased as well, rising by about 1.3 million between 2004 and 2013. From 2004 to 2014, the number of students participating in school choice programs more than tripled to nearly 354,000. As Juan Williams argues, school choice “treats children not as mere data points but as thinking, feeling, and multifaceted people — each with a unique, God-given potential that deserves the chance to flourish”. In 2014, there were 126 new major federal regulations that are expected to cost $100 million or more each year, an increase of 46 compared to 2004. “[S]ince 2012,” writes Karen Harned, “at least one in five small-business owners identify government regulations as their most important problem”. She continues: “For the American small-business owner, the opportunity costs of federal regulation are all too often crowding out investment and hiring”. From 2002 to 2012, the percentage of high school students who graduated on time increased by 8 percentage points. “America badly needed the recent small improvement in graduation rates. She needs much more still,” concludes Matthew Ladner. Since 2005, U.S. economic freedom has declined by 3.7 points, according to The Heritage Foundation’s Index of Economic Freedom. As Anthony Kim notes, “Increased tax and regulatory burdens, aggravated by favoritism toward entrenched interests, have undercut America’s historically dynamic entrepreneurial growth and confined the U.S. economy to the rank of only ‘mostly free’”. Culture matters, as observed by several of the Index’s commentators. High schoolers in an achievement-oriented environment are more likely to avoid risk behaviors and make healthy choices for their future. Communities that champion marriage will see stronger families and better well-being for their children. And those who place educational choice in parents’ hands can expect to see improved student outcomes. A culture that values mutual aid among its citizens and the inherent dignity of work and self-sufficiency will be less dependent on the government and more upwardly mobile. Freedom and opportunity depend on the character of the culture. Correctly diagnosing the root causes of our social challenges is crucial. The typical liberal diagnosis of social and economic problems is that they are caused by “the system,” and their preferred solutions hinge on more government intervention through increased spending and greater regulation. However, failing to address the true sources of a problem is likely only to exacerbate it. Take the alleviation of poverty, for example. In the War on Poverty, rather than focusing on incentives that would address family breakdown and non-work, the government opted for spending as its primary strategy. Decades of expanding government antipoverty programs and trillions of dollars later, poverty has not declined significantly. The same may be observed in education. Years of increasing expenditure and expanding federal intervention have not led to greater achievement. 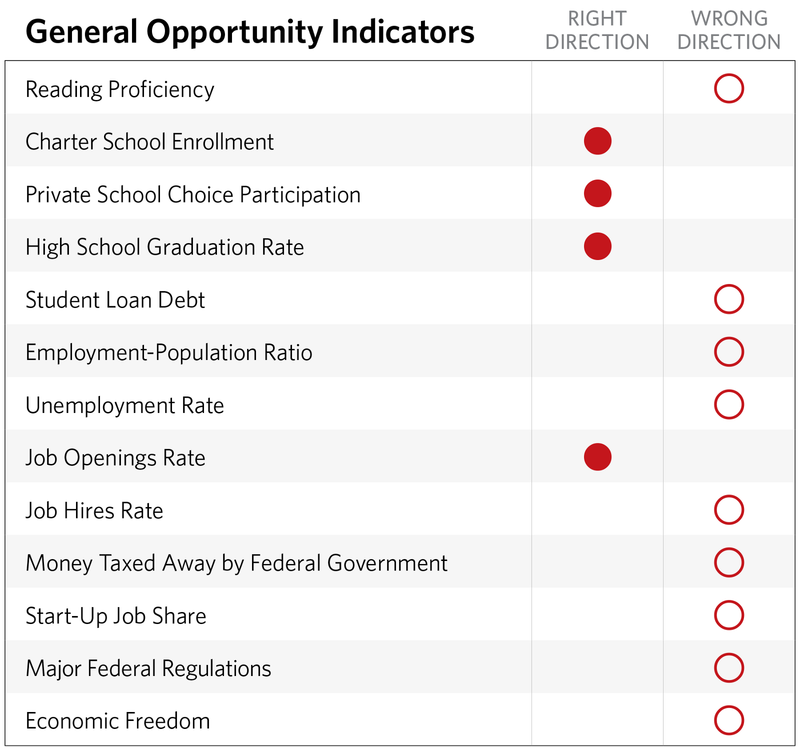 Recent innovations in school choice, however, have already shown promising results. Paying attention to the cultural ecosystem is critical. In an environment of mutual care, the well-being of individuals, communities, and society at large is understood to be interdependent. Issues are interconnected as well: Changes in one sector can reverberate across the entire system. 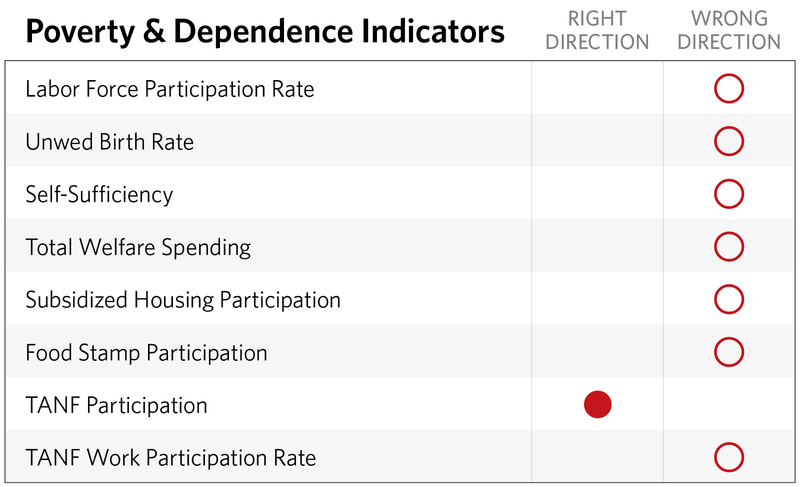 Marriage, family, child well-being, education, employment, poverty, economic mobility and growth, and entrepreneurship all relate to each other, as the Index’s indicators and commentaries demonstrate. Consequences are lasting but not irreversible. Social and economic trends, good or bad, may last for decades. Americans today are still living with the consequences of the sexual revolution in the 1960s and ’70s. In the ensuing decades, divorce, abortion, and unwed birth rates accelerated. But even such seemingly unrelenting trends can reverse course through policy and cultural efforts. The abortion rate, for example, has fallen back to pre-Roe levels. The divorce rate plateaued and then started to decline (although it still remains high). The crime rate has dropped, and a greater proportion of younger high school students are remaining abstinent. The 1996 welfare reform ended entitlement in one broken government program and helped able-bodied adults back to work. Selfless grassroots leaders, “healing agents” who make themselves available 24/7 for the long haul, continue to revitalize and restore hope to their neighborhoods. The school choice movement is putting educational decisions back in the hands of parents. With perseverance, we can accomplish positive change. The right solutions require courage and innovation. 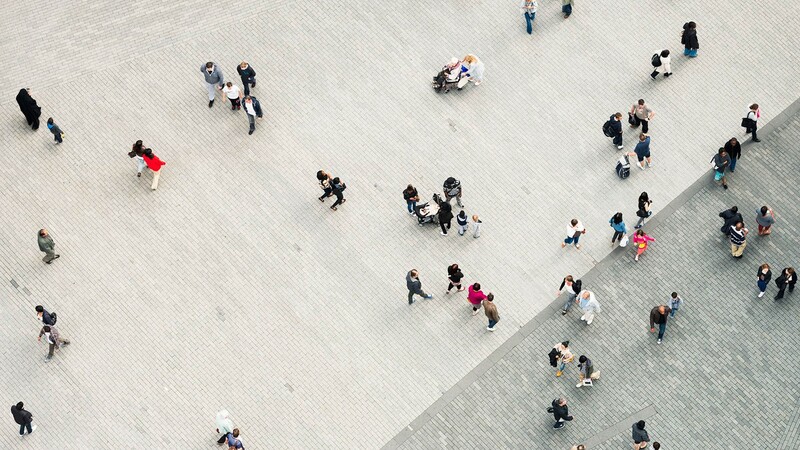 Leaders will need to challenge the status quo and make a compelling case for a new direction that emphasizes the significance of family, civil society, and policy reform. Policymakers must acknowledge that family breakdown is a primary cause of child poverty and implement policy that strengthens marriage and alleviates hardship for families. In education, leaders should heed research suggesting that choice options could bolster high school graduation and college enrollment, which have lasting economic implications. And for civil society to thrive, laws should protect, not limit, religious liberty. Pursue policy that promotes life, marriage, and religious liberty. Pursue limited government that encourages the role of civil society agents and organizations. Promote student-centered education choice options. Teach and reinforce, throughout high school, sexual risk avoidance and healthy relationship skills and messages. Advance comprehensive welfare reform, focusing on restoring self-sufficiency through work and eliminating work disincentives in social safety-net programs. Reduce governmental regulations that impede entrepreneurship and the growth of small businesses. Identify and study effective and successful strategies and approaches. © 2015 by The Heritage Foundation. All Rights Reserved. A think tank devoted to the principles of free enterprise, limited government, individual freedom, traditional American values, and a strong national defense.